Technology has come a long way since the original "hand clapping" living room lights; Home automation has become a world of wonders where you can control everything, including the temperature, the mood lighting and the auditory landscape around you. There are already great Alfred Powerpack workflows for controlling your home environment, so make yourself comfortable and take a look at a few of our favourites below. The Nest thermostat is an incredibly clever temperature controller for the home; It learns from your usage, and automatically turns the temperature down while you're away, helping keep heating costs down. 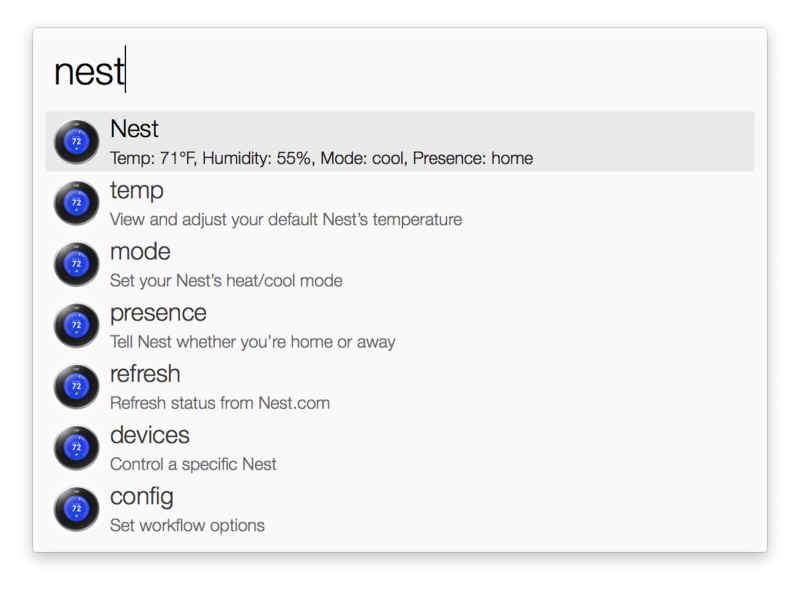 Jason Cheatham created a Nest Controller workflow that allows you to see what your Nest is up to, and control it from Alfred. Whether you're just curious what mode your Nest is in, or you want to let it know you're going out, the workflow makes these controls readily available from Alfred's search box. Coloured lighting is such a fun way to change the mood of a room, and Philips Hue lightbulbs are a brilliant way to create these moods. 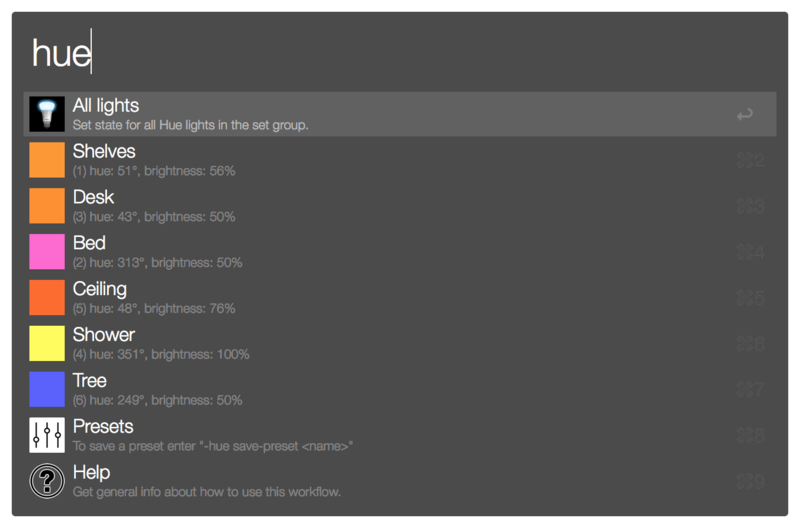 The Philips Hue Controller by Ben Knight is a workflow that lets you create presets and give them names for easy access later, as well as control individual lights for brightness, effect, colour, or simply turn them on or off. Ben created some fun presets for his own Hue lightbulbs, themed around Christmas, his favourite hockey team (the Boston Bruins) and a "concentration" preset to remove distractions when working at home. Once you've set your lighting to be all nice and cozy for the evening, what's more jarring than a bright computer screen burning your retinas with its dazzling white light? Thankfully, f.lux is a Mac app that adjusts your computer's display to the time of day, so that the light is warmer at night. There are a few workflows available to control f.lux from Alfred for a more comfortable evening lighting; The Flux Control by ClickySteve even includes a page of Alfred Remote icons, making it easy for you to control f.lux on your Mac without having to even move off the sofa! Add that final touch with some great music. Whatever your tastes and your favourite music player, there's almost certainly a workflow for it. 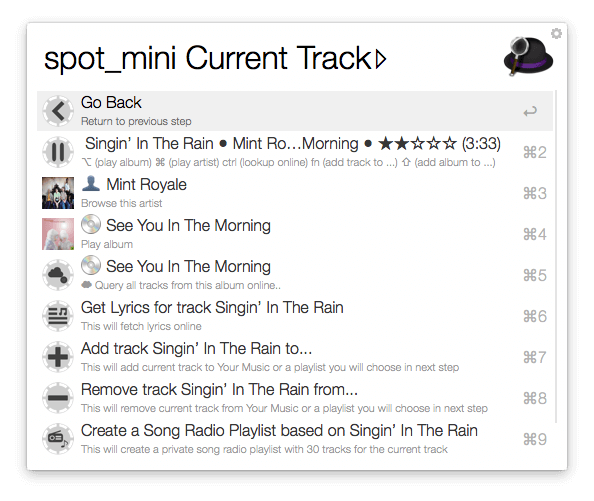 We're very fond of Spotify, for which there's a fantastic Spotify Mini Player workflow. You'll also find Music Player workflows for Rdio, iTunes, Last.fm, Google Music and more. Take a look at Packal and you'll find workflows for your favourite music player, as well as instructions on using them. Some also include Alfred Remote controls. These are just a few of the ways you can use Alfred to control your home, from removing the need for the numerous little fiddly plastic controllers that come with various devices to giving you a centralised way to tell them what to do. The beauty of workflows is that you can customise them to your personal preferences; You could even create presets that span multiple connected devices, like switching on lights and putting on some groovy tunes all at once to help you wake up in the morning!